The other day my 2.5 year old son added a station platform to his train set, and told me “red station is Footscray, green is West Footscray, yellow is Sunshine, and blue is Parliament”. So how does colour get used at Melbourne railway stations? It appears my son has been paying a lot of attention – Parliament is blue. 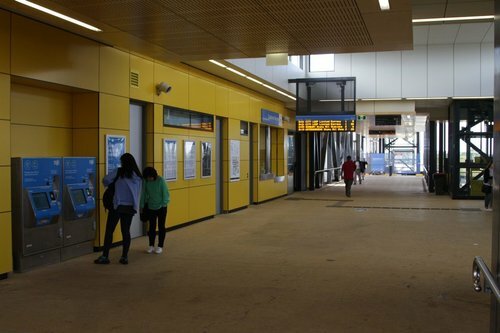 The last three stations were all rebuilt in 2013-15 as part of the Regional Rail Link project, hence the similar design, but the architects were smart enough to give each station it’s own identity through the use of a feature colour. Compare this to the growing number of stations rebuilt across Melbourne by the Level Crossing Removal Authority. Notice a common grey theme? Apparently the Level Crossing Removal Authority does use colour at some stations. 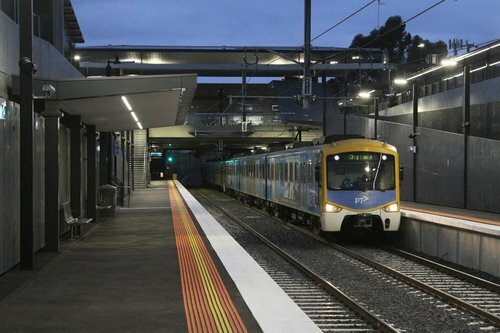 Ormond, Mckinnon or Bentleigh stations being three of them. The only problem? They used the same identical colour palette of yellow, orange and red at each station! 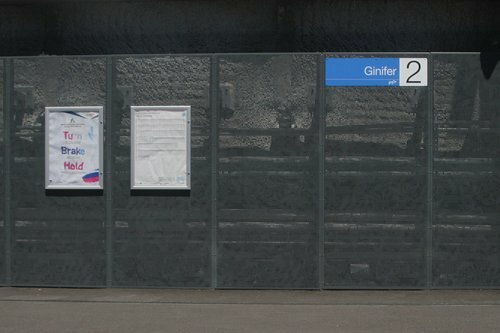 It shouldn’t cost anything more to use coloured panels instead of plain grey – so why does every station have to look the same? 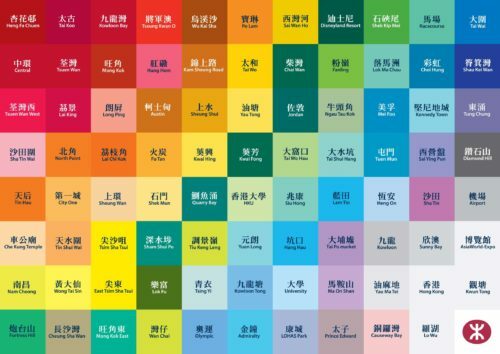 In Hong Kong every station on the MTR network has a signature colour. The main reason bright colours were adopted when the first line opened in the 1970s was to lighten up the subway system, according to Andrew Mead, the MTR Corporation’s chief architect. With no windows or natural light, underground platforms can be gloomy. Bright colours are associated with beauty, and they bring a dash of that to the mostly subterranean stations, he says. The corporation could have chosen a neutral white design. But Mead says an important factor in picking different colours was function. Underground, where there are no landmarks to look out for like when you’re travelling by bus or car, colour helped differentiate the MTR stations, and gave each their own identity. That was important, Mead says, because “back in the 1970s, there was still a high level of illiteracy” in the city. 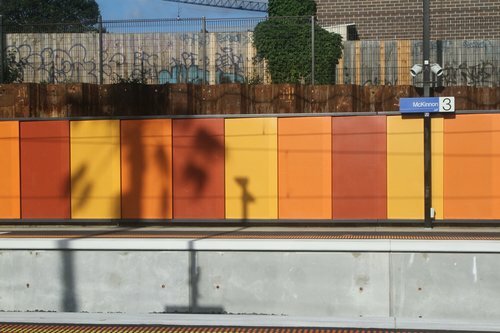 Another place that lacks landmarks is a Melbourne railway trench, or onboard a train with advertising covered windows – so why is the use of colour at Melbourne railway stations so rare? Interesting. Aesthetics always seems to be last in the list of things of importance with our trains but as you point out aesthetics (in this case colour) are important to way-finding and a sense of well-being. You might also note that the colours seem to attract less of the meaningless graffiti than the bland grey. Wayfinding with colour is an interesting point – the fact the MTR uses unique colour schemes for each colour leads to a conflict with the use of colour per line on the network map. I assume Duplo bricks serve as the model platform there? At home it was makeshift HO track and Lima trains on the dining room table with a line of audio cassettes lined up as the platform – probably got more use there than actually playing them! On the colour issue Perth went down the path of colour coding their station name signs but not so much the surrounds – Armadale and Thornlie lines yellow, Midland Line purple, Fremantle line dark blue, Joondalup line light green and Mandurah line orange. 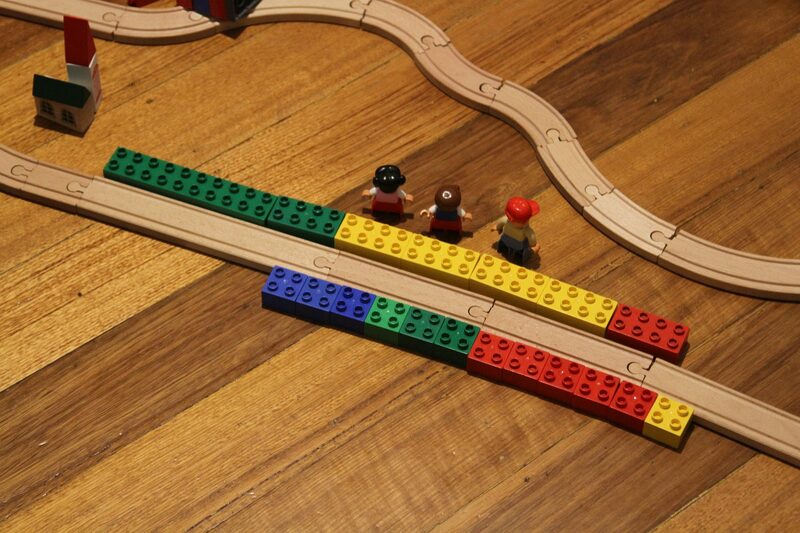 My son uses Duplo as the platform on his train set, and books for his larger trains. The original 1920s Sydney underground stations have different coloured tiles. It cannever be proven, but rumour has it this was because of a significant level of illiteracy at the time. Each station on the city circle line was tiled throughout with cream body tiles common to all, but with coloured top and bottom courses distinctive to individual stations. The tiling was part of Bradfield’s scheme to assist in easy identification of stations by passengers. I suspect the LXRA stations are all the same colour to cut down on designer’s fees. Although why they couldn’t ask for a design that would work in multiple palettes is beyond me. Melbourne has a history of groups of stations next to each other being built with the same colour scheme. Hawksburn-Malvern and Glenferrie and Auburn look near identical and Caulfield and Camberwell look different from their surrounding stations only because they were grade separated in different directions because of topography. Many lines also had their original stations built to the same design and have only been differentiated by station upgrades and new stations. Skyrail has the advantage that more of the surrounding landscape is visible to passengers and so the surrounding buildings will make it easier to differentiate than those in a cutting. 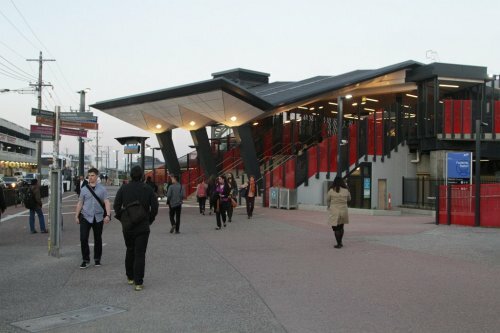 Good point about how stations have historically looked the same – I’ve got a half written piece on the different eras of design used on the Melbourne rail network, but didn’t think to link that idea with the modern use of colour. 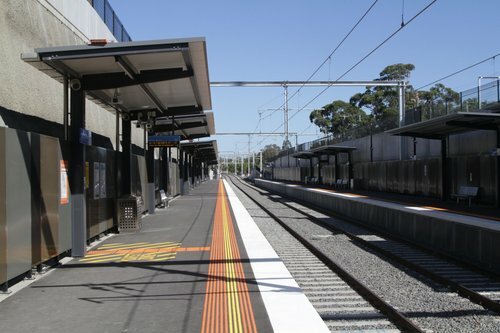 I have always wondered if it’d be possible to construct a flow chart to uniquely identify every Melbourne Suburban train station without reading any of the signage. So if you’re underground (in the loop), then blue = Parliament, red and white = Melbourne Central and beige = Flagstaff. If there are more than 4 platforms then you can go by construction: Older style platform awnings with a modern concourse at one end = Flinders Street. High roof over all platforms = Spencer Street. Wide platforms with a mix of modern and older style buildings = Footscray. Elevated over a wide, busy road = Richmond. Modern construction at one end and older style at the other = North Melbourne. 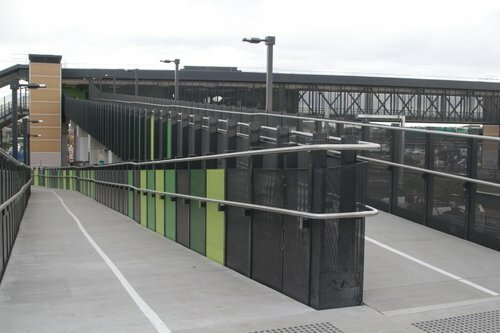 Why does Southland Station have an underpass for pedestrians while Coolaroo has an overpass? 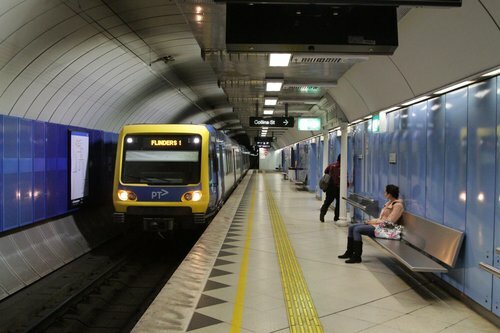 Interestingly, Flinders Street Station has an underpass as well as an overpass! The overpass is linked to the platforms via escalators – so I wonder if they were stairs 150 years ago? Are these stairs still there? The Swanston Street end of Flinders Street Station was once ramps, except for platforms 12 and 13 which were stairs, which are still there today. In 1984 the ramps were replaced by escalators at platform 2 and 3, platforms 4 through 9 followed in the 1990s, with platform 10 following in 2007.